Can anyone tell why no new D5s are on road in Ireland yet. Only seem to be demo models. Is it because HSE model here only has coil suspension and no heated seats and no panoramic roof. They are all options on HSE here. Stingy on Land Rover Ireland. Dont really care about heated seats or roof but will coil suspension be a backward step as opposed to air on road? I suspect the reason is quite simple. They are way beyond the average spending capabilities of the majority of Irish new car buyers. And even though dealers are beginning to promote the 2 seat commercial a bit more now, which is a lot cheaper, there are none in stock anywhere, they are only available to order, which could take anything up to three months or more by the time the conversion and paperwork is all sorted out and Revenue have been persuaded to accept it as an N1 vehicle. Which is stupid and rather typical of the current Irish distribution system. In the old days (in particular during the Tdi & Td5 era), dealers stocked mainly Commercial variants, for customers to look at, test and purchase off the forecourt, why? Because thats what the dealers and the then distributor knew would sell the most. There are no D5's yet in United States. The demos are very scarce right now. I'd have to drive 8 hours to view a D5 in person today. My guess is a staggered release. We are not scheduled for D5 until mid-2017. I don't know about Ireland. I've seen a Silver 171-KK one on the ring road in Kilkenny, two mornings in a row. APL I'm not so sure how popular the "2 seat commercial van" is going to be. I think the days of the "van Jeep" may be behind us, fine for builders & farmers, but the former are largely now in real vans & the latter in pickups such as the Isuzu D-Max, both of which give you more than two seats. I think people have gotten used to having more than 2 seats & a panelled off rear, with the likes of the utility models of the D4, Land Cruiser & Pajero. Can't see many going back to a "Van Discovery" when you can have all the bells & whistles in a Land Cruiser or Pajero if it's a high towing capacity 4x4 vehicle that you need or want. Plus with Revenue cracking down on the private ownership of commercial vehicles I wouldn't be hanging the sales of D5's on the "Irish Van conversion" variant. If there was a Utility 5 seat version of the D5 that might sell, but it seems that there will not be. And funnily enough, I heard just as many people over here bemoaning the demise of the 2 seat Discovery 4 Commercial when the 5 seat became popular. So if marketed correctly, there are small businesses out there who still need the loadspace that the 2 seat offers, and there are still those who would want to be able to claim back the VAT wherever possible. Of course it remains to be seen if Revenue will actually give it an N1 category. Edit to add.... I would come under the "enthusiast" banner, I've been a LR owner since the early 90's, but I wouldn't purchase the Van Conversion D5, just to get one. I wouldn't like my new car to have been hacked apart in a shed down in Rosslare, or wherever they do the conversions these days. Especially when having been spoiled by the 5 seat utility D4. Then add to that the restrictions of use on a commercial vehicle, which by all accounts, revenue are cracking down on these days. But that's all my own personal take on it & only time will tell what lies in store here for sales of the D5. .....but who in reality is going to spend €92K on a Discovery 5? I've actually tried building & pricing my desired spec on the Irish LR site, but of course while you may be able to build it, it won't as far as I can see price up the final spec. Typical Irish attitude of "the price is secret" You can, it seems build & price the Disco Sport, but not the D5. I've left LR ownership middle of last year when I traded my 131 D4 Utility & am currently driving an X5. It has all the bells & whistles that I want in a spec & being the M-Sport version it has some lovely extra styling & trim finishes. It cost just over 80K new & carries an annual road tax of 390Eur. So leaving aside for a moment the "apples & oranges" comparison of an X5 versus a Discovery in terms of capabilities off road, towing etc, The X5 doing everything & more that I ask of it. It doesn't make any sense for me to even consider the D5. This is a touch sad as, as I've said up-thread I've been a loyal LR owner since the early 90's. But I don't see myself going back to Land Rover anytime soon, based on the financial comparison. I was in a Landrover main dealership about 10 days ago and the sales man told me that there would be no commercial D5. I told him I heard there was one in the pipeline and he refused to believe me. I'm no good at links but check out Carzone where AutoBoland have a commercial 2 seat nearly ready for sale! Just found it. I'd love to go back into the dealership and show them this ad. 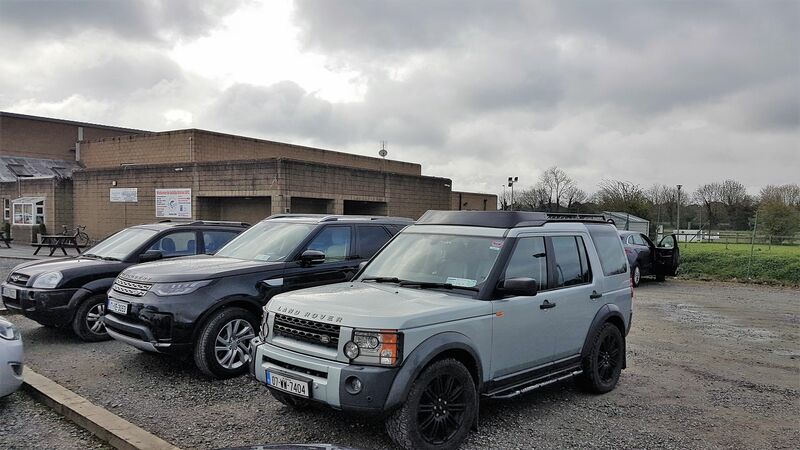 There's definitely no doubt about the theoretical availability of the Commercial D5's, indeed the main dealer in Wexford is now cursing the distributor for not supplying them and the 5 seat models, as he agrees these would be far easier to market and sell than the current top of the range HSE's they have been supplied with. But there are no physical examples of either the Commercials or the 5 seat models in the country as of yet, seemingly. Maybe Solihull just haven't got round to building the 5 seat versions yet, who knows??!! Well, still no sales over here. One Dublin dealer has a HSE priced at over a hundred thousand Euro!